Learning about pumpkins is a Fall favorite! I love when I can incorporate some science into our reading and math block too. 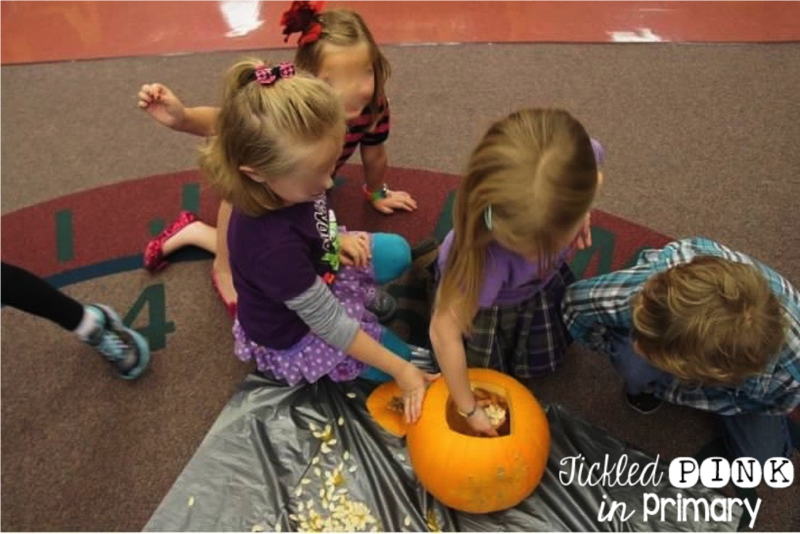 Learn about the pumpkin themed books and activities that we do in our classroom. In the Fall, we always did a pumpkin themed week and learned about the life cycle of pumpkins. I had the big book Pumpkin, Pumpkin and used it to teach about the life cycle of a pumpkin. I like this book because the text is simple and easy for students to pick up on. I also used the book Seed, Sprout, Pumpkin, Pie to show some real life images of the pumpkin life cycle. For our weekly poem, we used the Five Little Pumpkins book which the students LOVED reading!! It has very catchy words and you can do hand motion for each page for added fun. 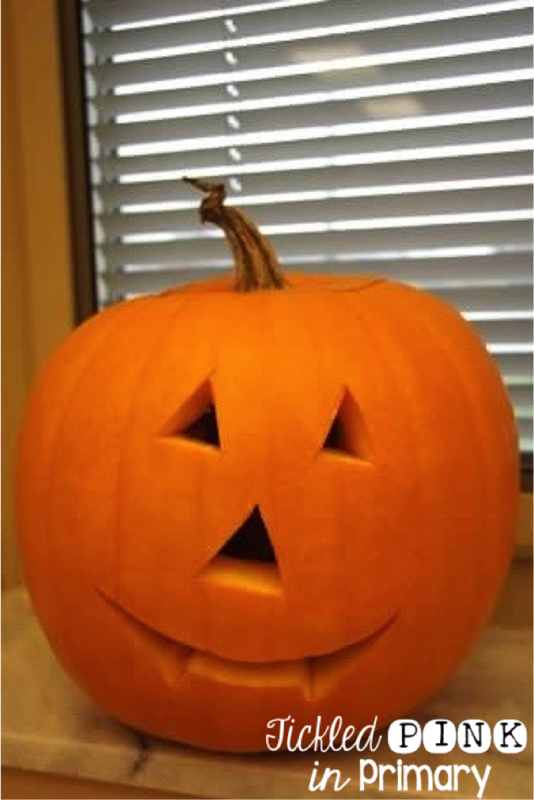 Finally, another favorite of my students was The Legend of Spookily the Square Pumpkin. This book is also great to teach about bullying. Some of the links above are affiliate links. After learning all about pumpkins, we used this Pumpkin Life Cycle sequencing worksheet to show how a pumpkin grows! Students also used this emergent reader to read about the life cycle of a pumpkin as well as color the pictures appropriately. Students could then put these in their book baskets to practice reading later on. Of course we had to have some pumpkin themed literacy and math centers! This Pumpkin Pie matching game helped my students practice reading CVC words and matching them to the correct picture. Some students simply matched the cards, while others turned it into a memory game. You can also have students record the words that they found using this worksheet. Since they were learning about base 10 blocks and simple place value, I put this pumpkin place value game in my math centers for the week. It works on numbers 1-20. If you put a dot on the back of the card where the correct answer is, it can be self checking!! There’s also another activity with this game where students can use real pumpkin seeds to match the number they see. After students played the game, they could use this worksheet to work on more place value. My higher students worked on numbers to 100, while most students worked on 1-20. Some of these centers are included in my Fall Literacy & Math Bundle. At the end of the week, I brought in a pumpkin and let the students take turns getting out a handful of seeds. We used most of our 5 senses to describe the pumpkin. Sadly, we can’t cook at our school or provide snacks for the kids, so I let the kids take the seeds home to cook them if they wanted. 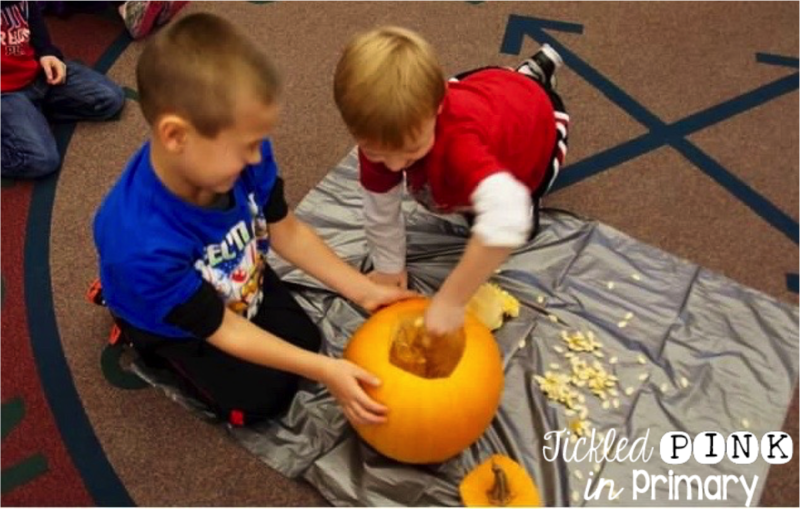 They loved getting to feel the inside of the pumpkin! After we removed the seeds, I let the kids vote on how we should carve the pumpkin. We graphed their votes, so we could easily see which way the class wanted to cut the eyes, nose, and mouth. This is the face they decided on!